While testosterone undecanoate has been available for oral substitution for more than two decades, it was first demonstrated in China that intramuscular administration of testosterone undecanoate in tea seed oil (125 mg/ml) has a prolonged duration of action (Wang et al. 1991). Therefore the pharmacokinetics of testosterone undecanoate in comparison to testosterone enanthate were tested in two groups of orchiectomized cynomolgus monkeys (Partsch etal. 1995). After injection of 10 mg/kg body weight of the respective esters serum levels of testosterone remained above the lower limit of normal for 108 days, compared to 31 days after testosterone enanthate injection. Pharmacokinetic analysis revealed a terminal half-life of 25.7 ± 4.0 days for testosterone undecanoate, compared to 10.3 ± 1.1 days for testosterone enanthate. The maximal testosterone concentration of 72.6 ± 11.7 nmol/l after testosterone undecanoate injection was significantly lower than 177.0 ± 21.3 nmol/l after testosterone enanthate injection. In a recent monkey study it was demonstrated that biological effects of testosterone esters are determined by the pharmacokinetics and degree of aromatization rather than the total dose administered (Weinbauer et al. 2003). Twenty adult male cynomolgus monkeys were randomly assigned to treatment for 28 weeks with either testosterone enanthate every four weeks, testosterone buciclate every seven weeks, or testosterone undecanoate every ten weeks. Each injection delivered 20 mg pure testosterone per kilogram body weight. Despite a smaller total dose of testosterone, increase in body weight or lowering effects on serum lipids were significantly stronger with the long-acting testosterone undecanoate or buciclate compared to testosterone enanthate. In a clinical study in Asian hypogonadal men, eight patients received one intramuscular injection of 500 mg and 7 of the initial 8 hypogonadal patients one injection of 1000 mg testosterone undecanoate (in eight milliliters tea seed oil) in a cross-over design (Zhang et al. 1998). Follow-up blood samples were obtained weekly up to week 9 after injection. In both study groups, mean serum levels of testosterone were above the upper limit of normal during the first two weeks after injection. 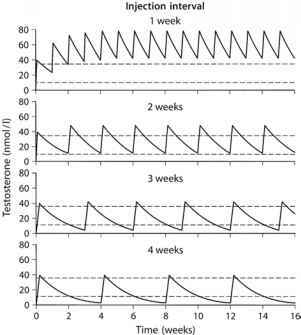 Thereafter, mean serum concentration remained in the normal range up to week 7 after injection in the 500 mg-dose group and at least up to week 9 in the 1000 mg-dose group. The terminal elimination half-lives were 18.3 ± 2.3 and 23.7 ± 2.7 days for the 500 mg-dose und 1000 mg-dose groups, respectively. Administration of 500 mg of this testosterone preparation every four weeks, after an initial loading dose of 1000 mg, for up to 12 months to 308 healthy men for male contraception maintained serum levels of testosterone in the normal range when measured directly before the next injection (Gu etal. 2003).